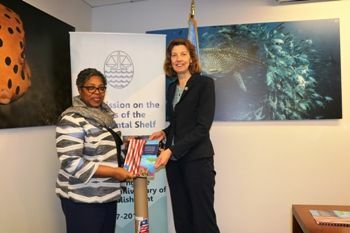 "After Nearly Ten Years of Work, Liberia Deposits Submission for Extension of Continental Shelf at United Nations"
(New York, October 26, 2018) The Republic of Liberia has deposited its 'submission' with the United Nations Division for Ocean Affairs and the Law of the Sea (DOALOS), for a claim of the extension of Liberia’s Continental Shelf beyond the 200 nautical mile limits. Deposited earlier this week, the submission is in accordance with Article Seventy-Six (76) of the United Nations Convention on the Law of the Sea (UNCLOS), which mandates that information on such limits be provided to the United Nations Commission on the Limits of the Continental Shelf (CLCS). The Commission on the Limits of the Continental Shelf (CLCS) is a body of twenty-one (21) experts, recruited on the basis of equitable geographical representation; to facilitate the implementation of the 1982 United Nations Convention on the Law of the Sea. According to a dispatch from Liberia's Permanent Mission to the United Nations, Liberia's submission was made within the deadline prescribed by the United Nations Convention on the Law of the Sea (UNCLOS), and comes after nearly ten (10) years of work. The Deputy Minister for Legal Affairs at the Ministry of Foreign Affairs Cllr. Deweh Gray and the Principal Director for Administration and Legal Affairs at the Liberia Maritime Authority (LMA) Attorney Nya Gbaintor deposited the submission on behalf of the Republic of Liberia. Following the brief ceremony, His Excellency Ambassador Dee-Maxwell Saah Kemayah, Sr. Permanent Representative of the Republic of Liberia to the United Nations, described the deposit as a milestone for Liberia "that has been overdue since the past ten (10) years", and a commitment that under the leadership of His Excellency President George Manneh Weah, the Country will uphold international best practices. Liberia is expected to deliver a presentation on its submission to the Commission on the Limits of the Continental Shelf (CLCS) at its Forty-ninth (49th) Session in early 2019; and await an evaluation by the United Nations Division for Ocean Affairs and the Law of the Sea (DOALOS) of the scientific data and legal points proffered to substantiate its claims.